As you may know, I’m a big fan of Stacey’s cute critters: they’re so fun to color and allow me to create cards with cute “visual narratives”. For this project I used a couple of them: April, a cheerful bunny on a swing, and Gracie, the sweetest bird ever seen resting on a Blossoming Perch. I started to work on this card by stamping the cute images and the background panel with Memento Tuxedo black ink and colored them with Copic Markers. When my coloring was complete, I ink blended some Cracked Pistachio Distress ink over the Cloud Stancil by My Favorite Things to create a spring sky on my background panel. Then, I fussy cut the critters and the perch and die-cut a scalloped frame out of white cardstock using the Framed Tags – Madison Creative Cuts by Mama Elephant. I foam mounted the frame over my background panel adding a vellum layer between them to soften the background. I heat embossed the sentiment from the Essential Thoughts Sentiment Set in white on a strip of yellow cardstock – because I wanted to keep all the elements colorful and bright to suit the overall mood of the scene. Then, I added all the images inside the frame and mounted it onto a regular sized card base. Finally, I added some sparkling clear sequins here and there as embellishment. Don’t forget that the new Spread Kindness collection is offered at a discounted price for a limited time after its release. 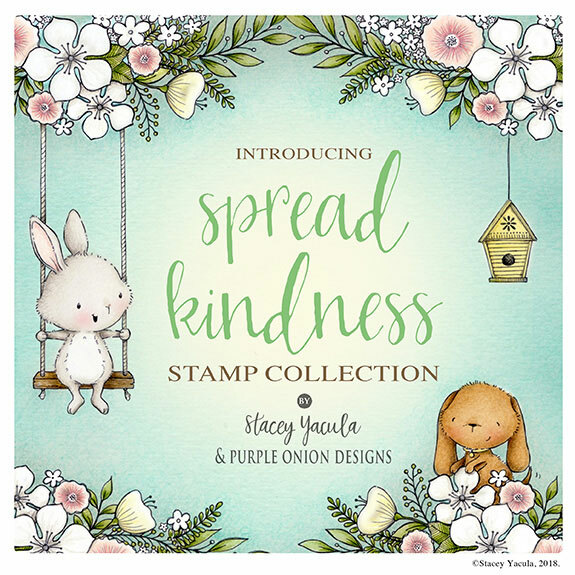 You can purchase the entire Spread Kindness collection (26 stamps – 30% savings) – or two smaller bundles: critters & coordinating stamps (18 stamps – 20% savings) or traditional images & florals (8 stamps – 20% savings). These discounted prices are available until Friday, June 22, 2018.
International customers can read the shipping information here on Purple Onion Designs blog.